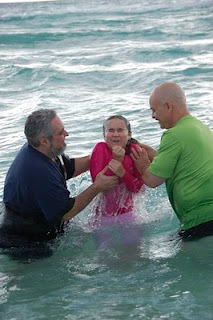 Anna is baptized at sunrise yesterday, Easter Morning. A very similar photo appeared on the front page of this morning's Miami Herald but with a photo of Anna's sister, Paloma, who was baptized yesterday too. That photo has a caption that reads in part, "Paloma . 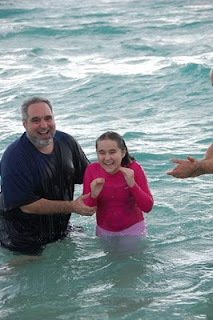 . . is baptized in the waters off 73rd Street and Collins Avenue after attending the 17th annual Miami Beach Easter Sunrise Service. Pastor Rick [Paloma's dad, a Friday morning breakfast brother], left, and Pastor Robert Fountain [of Calvary Chapel, Miami Beach] performed the baptism." I just love the expression on Rick's face in the second photo. What a joy to have your children accept Jesus Christ. I am reminded of the broad promise from Acts 16 at verse 31, a promise that I have claimed from my earliest moments as a father: "They [Paul and Silas] replied [to the jailer, who had asked Paul, 'Sir, what must I do to be saved'] believe in the Lord Jesus, and you will be saved - you and your household."